Thelonious Monk is referenced in 5 Manitou Messenger articles. In each, he is referred to as a “great” or treated as a hallmark of sound to which campus bands strive. However, he was not always well known. For years, Monk’s cabaret card was revoked because of a narcotics charge. This meant that Monk could not play in any club in New York that served alcohol, which was all of them. But instead of giving up, Monk sat in his room and practiced. When Monk finally got another break, it was 16 years later. He had been left behind and was no longer considered a forefather of “modern music,” which would become bebop. The reason Monk made it back into the mainstream was largely due to a favorable review by jazz critic Nat Hentoff (who just passed away this last January). With his comeback, Monk started recording for Riverside Records. The St. Olaf Library had Monk’s 10th album with Riverside on vinyl. It is Five by Monk by Five. 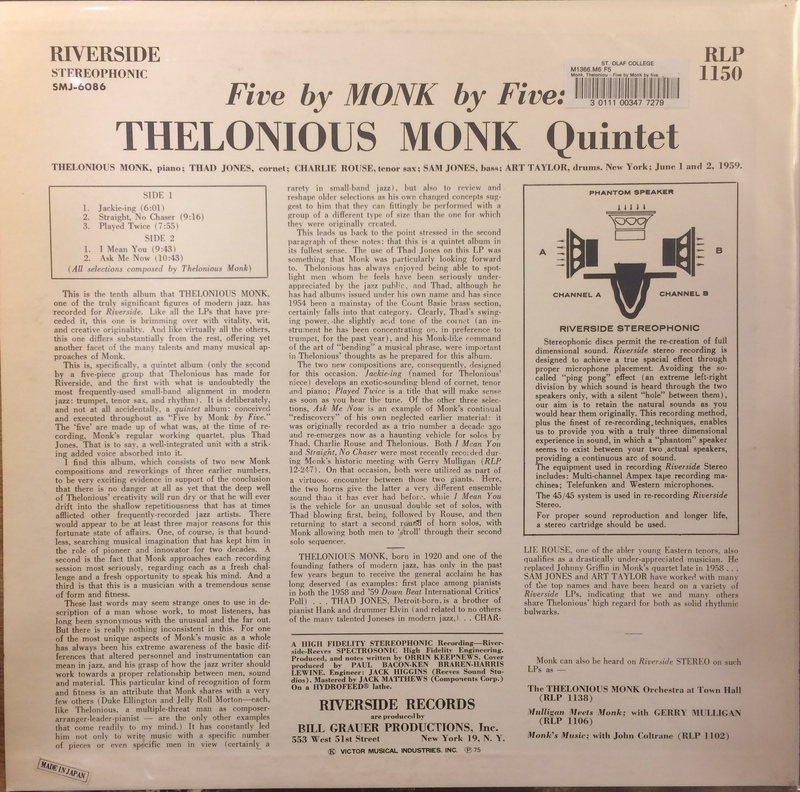 The rhetoric is that of a lost opportunity for Monk, with his review saying that he “has only in the past few years begun to receive the general acclaim he has long deserved.” However, the rest of the album review praises Monk’s intellectuality. The liner notes suggest that Monk’s two new compositions for the album were fresh. 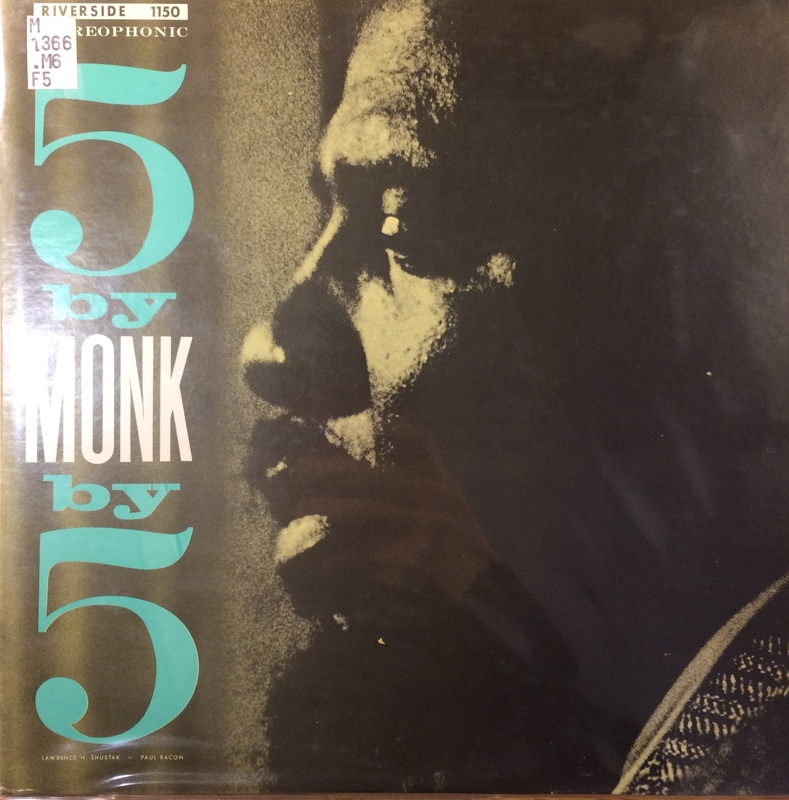 However, there is even more emphasis on the fact that Monk’s three older songs do not lack ingenuity with their rediscovery of “his own neglected earlier material.” In fact, Monk is praised for his approach to each recording session, “regarding each as a fresh challenge and a fresh opportunity to speak his mind.” You can hear such ingenuity for yourself in this Spotify playlist of the album. Monk certainly was to become known as a musician who speaks his mind. Five by Monk by Five was recorded in New York on June 1st and 2nd in 1959. In just 9 months time ,the Greensboro Lunch Counter Sit-ins would occur. Monk and his friends would get together (normally an apolitical group), and hold a benefit concert to support the sit-ins (Monson). Monk, however, had always been pouring his voice into his music. Here is a youtube vide to demonstrate what the lunch counter sit-in meant to the individuals who started it. I can only imagine to someone like Monk, who had been put out of his career for several years due to issues surrounding racism and segregation, would have felt being around these brave people. I encourage you to go back to the 1959 recordings on the above Spotify playlist and listen to the stories and experiences Monk’s quintet screams into the music. Even when he tried, Monk could not be completely apolitical, because his work was nothing but intellectual. Monson, I. T. (2010). Freedom sounds: civil rights call out to jazz and Africa. New York: Oxford University Press.